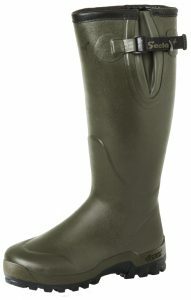 We love our new Seeland Estate Wellies! Another couple beating outings have gone by with the new Seeland Estate Wellington Boots getting some really good all day use. Ollie ordered the men’s UK 7, which fit him well (with a bit of room). But I (Dawn) also have size UK 7 feet – the men’s version were too big. After a couple weeks of Ollie boasting about his comfortable feet I decided I better order a pair of the Ladies 16″ version. I went with a UK 7 and they fit perfectly – so the sizes between the Gents & Ladies versions do differ. This does mean you get lots of mud in the grooves but it soon comes out. We have both slipped over in the mud / and frosty ground before in our old wellies, but so far so good – No slipping! The padded sole really makes a difference. It absorbs a lot of the vibrations you get when you walk. The neoprene lining keeps your legs and feet warm and snug in this cold weather. The neoprene lining also looks nice (in my opinion better than the bright blue you get in some Chameau’s!) If you suffer with cold feet, a neoprene-lined welly will keep your feet amazingly warm on the coldest days and comfortable on not so freezing days! The waterproof gusset allows for the extra movement that is required when walking and clambering around the countryside! It also allows extra space for larger calf’s if needed! We are now offering these boots from our online shop. Available on backorder – deliveries will be made within 10 days. Some popular sizes may also be kept in stock! Take a look at our Footwear range here and our Country Clothing here! 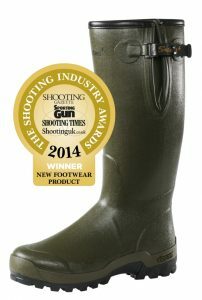 These wellies are made well, comfortable and a great price!